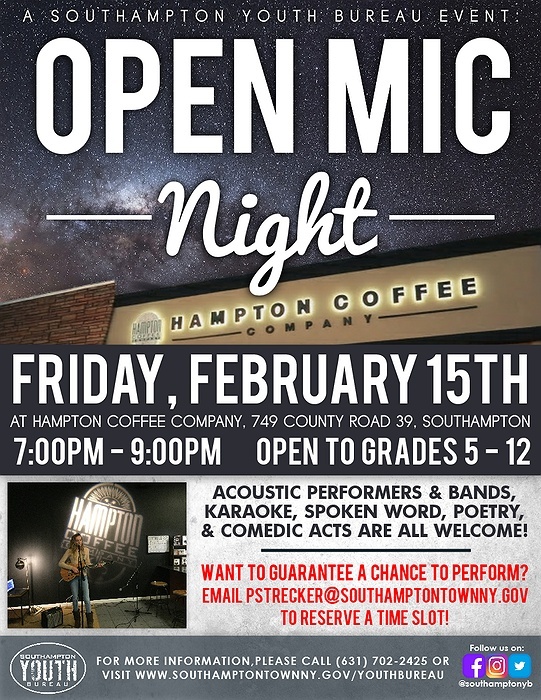 Subject: LongIsland.com - Your Name sent you Event details of "Open Mic Night at Hampton Coffee Company"
The Southampton Youth Bureau will be hosting their next Open Mic Night on Friday, February 15th from 7:00pm – 9:00pm at Hampton Coffee Company, 749 County Rd 39 in Southampton. Performing is free and open to youth in grades 5 – 12. Acoustic solo artists & bands, karaoke, poetry/spoken word, and comedic acts are all welcome to participate. Want to reserve a performance time slot in advance? Contact the Southampton Youth Bureau at (631) 702-2425 or email pstrecker@southamptontownny.gov to guarantee a chance to perform! For more information, please visit www.southamptontownny.gov/youthbureau.